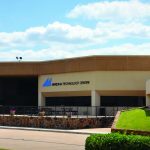 Three of the CareerTech Student Organizations (CTSO) at Meridian Technology Center have been recognized for their chapter achievements during the 2017- 2018 school year. Meridian’s HOSA – Future Health Professionals organization was named a Silver Star chapter. This designation was based on the number of members, attendance at the Fall Leadership Conference, participation in skills contests, money raised for the organization’s national service project and the documentation of chapter activities. Silver Star recognition was also given to Meridian’s Family, Career and Community Leaders of America (FCCLA) chapter. This award is given to chapters based on their participation in FCCLA activities. Chapters can gain points by competing in events, attending meetings and camps and submitting chapter activities for national program awards. FCCLA advisors can also earn points for their chapter by being a member of the Oklahoma FCCLA alumni association, earning advisor awards and their involvement in the organization for their district. During the recent state Business Professionals of America (BPA) Leadership Conference Meridian’s chapter won second place for raising just over $830 to support the Special Olympics through the organization’s Chain of Love fundraising efforts. Three Meridian students are also involved at the regional and state level with CTSOs for the 2018-2019 school year. 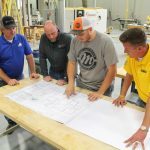 Business Technology student Brandon Conner, Guthrie, is BPA President; Business Technology student Jakob Lavicky, Stillwater, is BPA Vice President; and Precision Metal Fabrication student Dillan Grider, Perkins, is a SkillsUSA district officer. Full-time adult and high school students attending Meridian can join organizations related to their field of study: Business Professionals of America (BPA); Family, Career and Community Leaders of America (FCCLA); HOSA – Future Health Professionals; or SkillsUSA. 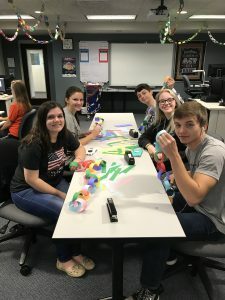 CTSO chapter activities align with program curriculum and offer opportunities for students to learn skills such as communication, teamwork and project management. 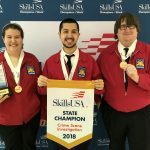 CTSOs also provide students a chance to gain leadership skills and compete against other technology center students from across the state and nation. More than half of the students at Meridian are members of a CTSO. Photo: Meridian’s BPA chapter won second place for raising just over $830 to support the Special Olympics through the organization’s Chain of Love fundraising efforts. BPA members are shown creating links to represent money raised. From left to right are Rebekah Peek, Stillwater; Kaytra Booher, Guthrie; Kaden Baumgarner and Hope Purdy, Perkins; and Austin Carver, Perry.